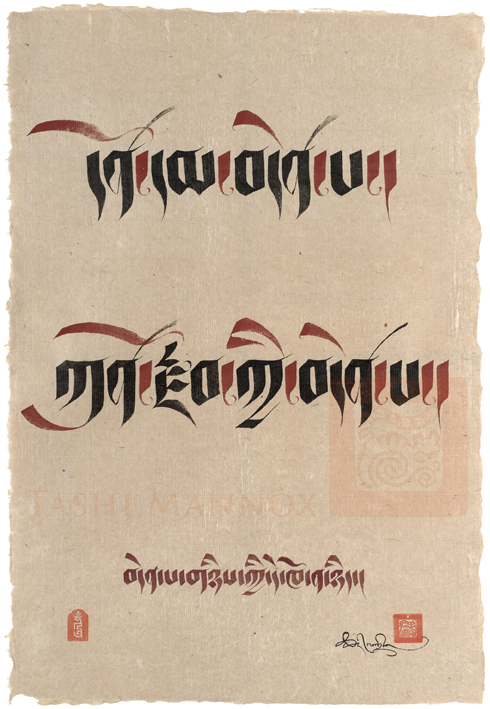 From the 6th April -September 3rd 2012, The Rubin Museum of Art in New York City presents the exhibition 'Illuminated': The art of sacred manuscripts explores the aesthetic and technological approaches in creating and adorning books from a variety of cultures and features illuminated Tibetan manuscripts dating as early as the 13th century. A detail of a 17th century Tibetan manuscript. Take the link here for more details on the exhibition. The Creation process of the calligraphy art piece called "Primordial Purity, Golden World"
First calligraphy in black ink that is set out with ample space to draw in a swirling leaf like pattern to be later painted and gilded. 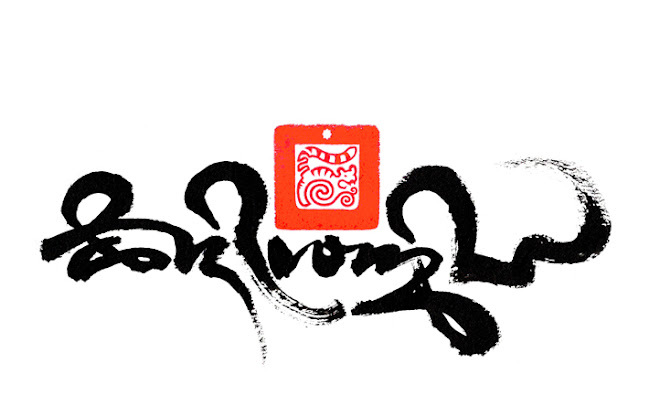 This particular calligraphy style is called Petsug script, that has a compact square bold character, purposely placed irregular as if to dance across the paper. 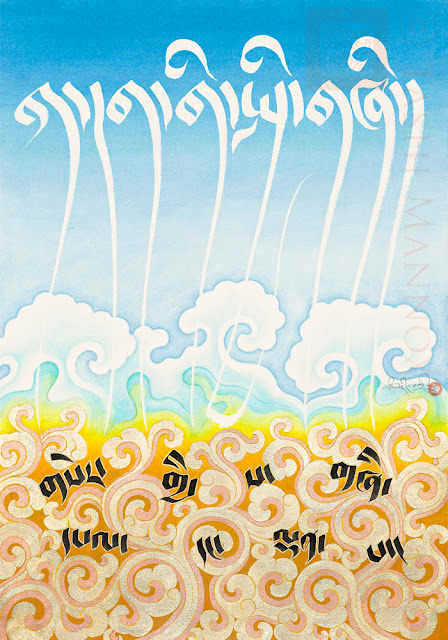 The text translates as "the mythological golden basis/ground of our know world, that is glorious and magnificent"
Other calligraphy painted with a latex rubber masking fluid that resists any water based paint. The above detail shows the rubber mask being removed with an eraser to revile the clean white paper below. 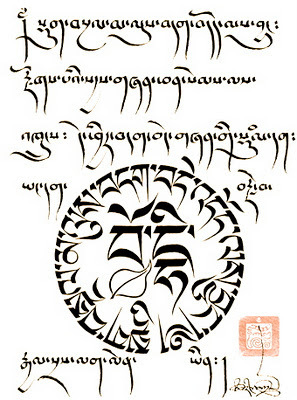 The below image shows the calligraphy in full, these words at the top of the piece are painted in a long tailed form of the cursive Drutsa script, known as 'round tailed Drutsa', that translate as 'universal, common ground of primordial purity'. Shades of yellow ochre pigment provides a suitable base to apply both gold and copper leaf. The top and bottom calligraphy together translates as 'The universal basis of primordial purity (of our mind/being). The glorious golden ground (of our world). Above, a detail showing gold and copper leaf mapping out the swirl pattern. A mass of swirling gold and copper leaf reflects the light brightly on the rough texture of the water-colour paper, where light is not reflected the swirl pattern appears darker than the background yellow ochre. The splendor of the universe, our world, from where we are born and return, can be experienced by us from a sacred viewpoint of our innate purity that is naturally within us. 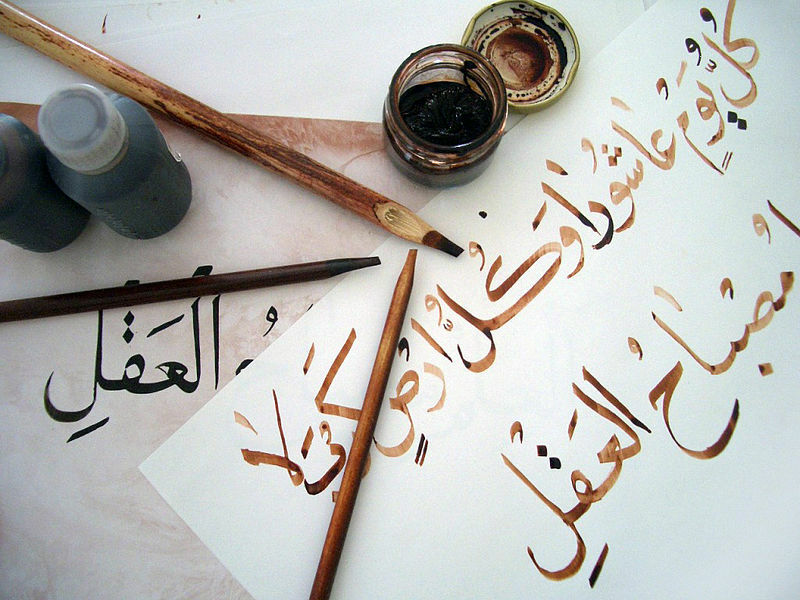 This interrelationship between heaven and earth evokes the creativity of man, expressed in words and the beauty of calligraphy. 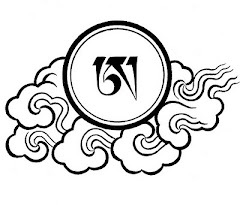 The uppermost line of Tibetan cursive script that soars high in the sky translates as “universal, common ground of primordial purity”. Below, as if dancing among the swirling energy of the earth are black letters that translates as “the mythological golden basis of our known world, glorious and magnificent”. 53x76 cm Dutch gold and copper leaf on a ground of acrylic paint. Limited edition prints are also available of this art piece and two others that feature in the Sharjah Calligraphy exhibition, for all enquires and to place an order for a print, please contact Tashi Mannox here. The word 'truth' in an ornamented Petsug script style, this is a detail of a larger art piece created for the Sharjah Calligraphy Biennial 2012. this is also available as a limited edition print and is shown in full, featured here. While perfect Buddha-hood is born from the desire to make others happy. This is why completely exchanging one's happiness for that of others is a practice of the bodhisattva. This calligraphy is based on the above prayer to develop bodhicitta, written in full of the smaller བྲུ་ཚ་ཞབས་སྒོང་མ 'round tailed Drutsa' script, a style popular in Tibet from the 1200s. 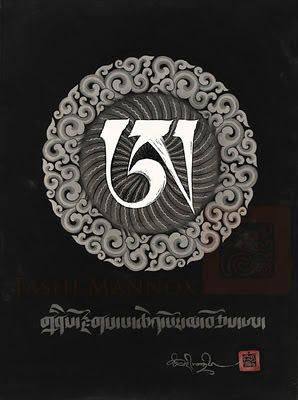 The Circle of larger Uchen script is a repeat of the first line of the decree, while in the very center is the Sanskrit word 'bodhi' in uchen phonetics. on heavy water-colour paper. ⓒ Tashi Mannox 2012. The central character illuminates white and resplendently pure among aura like swirls spinning from the blackness of limitless space. As this is the root syllable ‘a’in the classical Uchen script, the last letter of the Tibetan alphabet, from which all other sounds are produced, it is considered essentially pure and stainless. It represents the ultimate true nature of mind, which is equaled in all beings, who are countless as all the stars of the universe. 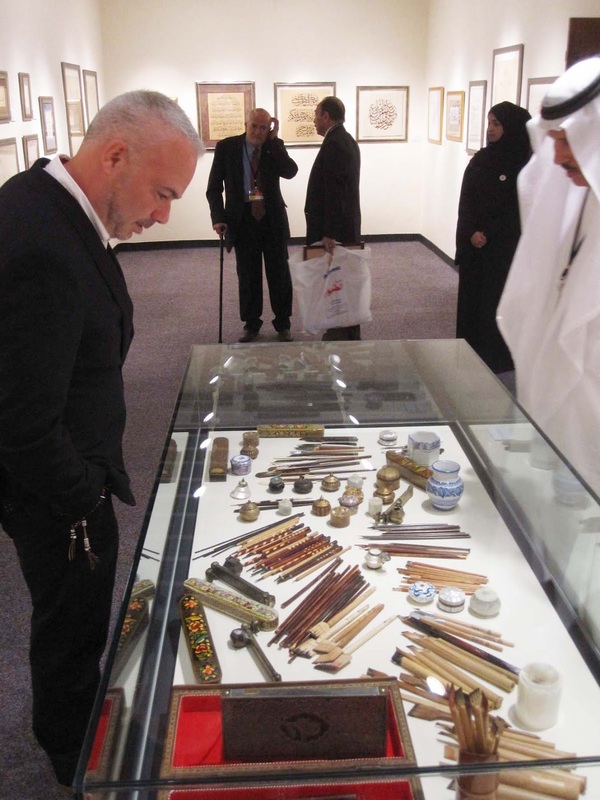 The above art piece "The Great Perfection Aa" was especially created for the Sharjah Calligraphy Biennial April 2012, the exhibition called “Universe” hosts celebrated Islamic calligraphy artist along with a few international artist of other denominations. The reproductions are premium-quality giclée printed, on a heavy weight museum conservation rag paper, ensuring stability and a colorfast longevity. Each image is carefully colour matched and in sharpness to the original artwork. The prints are edition numbered and hand signed and stamped with the artists’ personal seals. To place a print order, please follow this link to the TashiMannox on-line store. Constructing the art-piece, January 2012. Following the unprecedented success of our introductory course in Tibetan Calligraphy in June last year, The Shang Shung Institute of Tibetan Studies are very happy to be able to offer this beginners course for those who are new to the art or who wish to refine their technique by going back to basics. 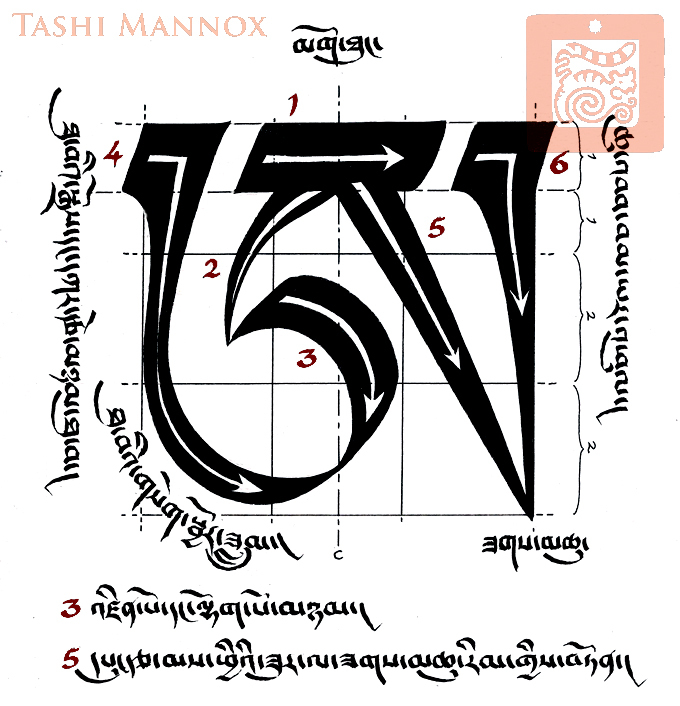 Tashi will explain and demonstrate the art of writing the classical Uchen script style, he will also guide participants through their own hand at forming the letters of the Tibetan Alphabet and more. This course will be followed in June by an intermediate / advanced course, as indicated below. For bookings follow the link here. For any event enquires please email via the link here. This intermediate / advanced course follows on from the beginners course held earlier in the year also with The London Sang Shung Institute of Tibetan Studies. The above two diagrams show the proportionate grid that the classical Uchen script style is based on. The size of the grid is determined by the width of the brush or pen nib. One width equals one part, two parts 3 x 3 makes a grid of nine squares that the main body of each letter of the alphabet is applied to. 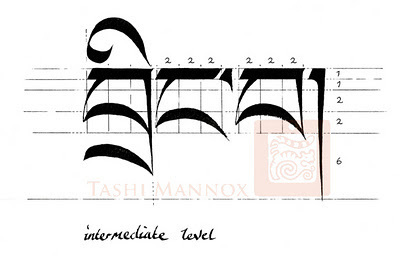 There are 9 of the 30 letters of the Tibetan alphabet that have long tails, an addition of 6 parts is measured below the grid to allow the uniformed length of the tails and the subjoined letters. Likewise, 6 parts are marked above the grid/head of the letters to allow uniformed placement of the 3 of the 4 vowel signs. For calligraphy that is pleasing to the eye, especially of the classical Uchen script, much like the proportionate beauty of the classical Roman script, that both traditions depend on the discipline of the proportionate construction, it is important to form the letters within the bounds of the grid, yet not shy to fill the grid space generously.